Largehearted Boy: Book Notes - Steve Himmer "Fram"
Book Notes - Steve Himmer "Fram"
Fram is a darkly witty and wildly imaginative novel, once again Steve Himmer has proven himself a master literary satirist. 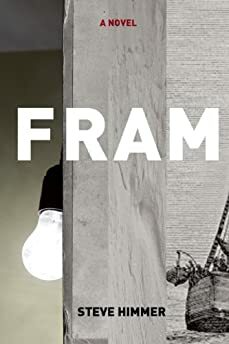 "Fram is an extraordinary meditation on the critical flaws in the systems we hold dear, and the human costs of those flaws." My first novel was very much about stillness and quiet and staying put. Writing Fram, my second, I had something almost deliberately opposite in mind — I was thinking about momentum, and of energy driving forward almost to (if not past) the point of frustration, certainly to the point of distraction and confusion and to the kind of unpredictable state that comes from sustained travel, like riding a bus for 24 or 36 or 48 hours at a stretch. I was thinking of movement for its own sake, and in many directions at once, in terms of style and story and what befalls character and reader alike. The book's title is the Norwegian for "forward," in fact, along with carrying a few other meanings in the course of the story. So the music I listened to while writing and rewriting Fram, and the music I thought about alongside it, often possessed that same kind of momentum. This novel emerged from around 15 years' reading and thinking and writing about the Arctic, in the course of which I shifted disciplines from anthropology to fiction, so a little traveling music makes sense. Melt Yourself Down, "We Are Enough"
From the opening squawks like a signal being picked up, the song jumps right into drums driving as if they've been at it for a while before we arrived, the way some journeys don't "begin" so much as feel like we've always been on them. I thought often while writing Fram about transmissions and signals — owing, I suspect, to Tom McCarthy's long essay Transmission and the Individual Remix which I think I read in my book's early stages — and so much of the novel arose from picking up voices from history, from accounts of Arctic explorers, from other novels and films and old magazines. This is a song I'll play at the beginning of a class if my students seem sluggish, because you can't hear it and not want to move. It's cheerful motion, the laid back momentum of possibility, and it sounds like it could just fall apart at any time and that's why we need to enjoy it right now. Which I'd like to hope is the same kind of rickety, risky forward charge Fram manages at its best moments as unlikely events pile upon unlikely events. Another track that jumps right in like it was already going without you, and doesn't so much "arrive" somewhere musically as it relishes a moment, a groove, and lets us settle into that pocket the way a very long ride with only a landscape of gradual changes to gaze upon develops its own particular rhythms. Dr. Remmy Ongala & Orchestre Super Matimila, "I Want To Go Home"
I have a visceral memory of the first time I heard the snaking guitars of Remmy Ongala's band, after picking up this album just because I'd recognized the CD spine as coming from Peter Gabriel's label. It's one of my peak musical experiences, right up there with — among others — the opening notes of Pentangle's first album or the guitar on Nic Jones' Penguin Eggs. Time and place and physical presence all bound up together in the sound as an idiosyncratic defining moment, the kind of moment I had in mind for Fram as I thought about what its characters — the married couple at its heart, Oscar and Julia — had in common as their own secret language of memories and jokes, the shared experiences no one else could ever possibly quite understand, and how those secrets propel their lives. This is a song that sounds joyful, and playful, but I'm assuming that based on the uplift of the fiddle and the buoyant drive of the tune. Because I can't translate the lyrics and only project onto them what I think I hear in their Inuktitut words. So much of Fram — so much of southern encounters with the Arctic — is that same kind of half-understanding and a process of pretending we understand more than we do. And of co-opting it. So listening to "Mamatuq" there's a part of me that thinks I know more or less what's going on, and another part of me that knows it doesn't, and that in-between state is where Oscar spends so much of his time. That's the history of Arctic exploration: pretending the region is a blank screen on which to project fantasies and desires from elsewhere, a backdrop against which to play out southern stories. That's what Fram does, too, of course, but I hope in a way that makes that problematic construction a part of the story. These horns and drums are just grinding, it's not a smooth momentum or an easy journey but sheer grit and determination to get somewhere — when the going gets tough and all that. It's like the hard part of writing a novel, and getting it published. And it's like the hard part of any journey when you aren't sure why you left home and if you'll ever get back but there's nothing for it but to keep going, plow ahead, and — like "Number 9" — hopefully find a groove that works on the way. Some transcendent moment that makes the trip worth it whether you ever get there or not, whether that's physical travel or writing a novel with no guarantee it will ever be published or read. Julian Cope, "Upwards at 45 Degrees"
A song in its own universe, a journey only one person can make with lyrics so impenetrable the way so much of the most exciting art risks the alienation of impenetrability. The way a marriage does, or a trip to an uncertain destination. Certainly Oscar and Julia's marriage, and Oscar's "polar fever," his obsession with all things Arctic and assumption anyone else knows what he's talking about — maybe not so unlike my own. I admire Julian Cope immensely, the way he's made a career by being entirely willing to go in his own directions time and again — the music, the books, the TV show! Who else could write a line like, "to penetrate the diamond the pituitary gland gets torn on its axis and frees?" I couldn't, but I'd like to think I might try and fail in some awesome way. This one sounds like contemplative movement to me, again like a bus or train window, or the in-between spaces of airports and stations. The modulation of speed like waves thought coming whether we want them or not, like a mind adrift. The bursts of trumpet like epiphany or the discovery of something totally unexpected and incredible sliding into view. There's something liminal about "Kodiak" — about lots of Whale Fall's music, really. I suspect I listened to this album more times in the course of writing the novel than any other. Mogwai, "May Nothing But Happiness Come Through Your Door"
Travel — like novel writing — often starts out buoyant and exciting, but pretty soon becomes a grind and a confusion and a discomfort. And then you settle into the ride, giving yourself up to it however long it's going to take. That's what this track is for me, because Mogwai are such masters of atmosphere, of music that moves slowly but never stops moving. I've heard it called cinematic music but to me it's the sense it gives of more happening, before and after the song, beyond the song — I enjoy that open-endedness, and I suppose I aspire to it, too. I wanted Fram to be full of that sense of other stories beyond the edges, the other lives and events we can't focus on because we're almost charging ahead. I don't think film is a big influence on my writing in general, but Wim Wenders' Until the End of the World seemed an important touchstone for this story. It's a film that has really stuck with me since its release, despite or because of the difficulty of watching it again due to tensions between filmmaker and studio. The mood of the film, the pace of it leaping from country to country and continent to continent with a plot that seems linear but not in the usual way, the way movement and momentum seem to be their own rewards… I wanted Fram to approach some of those qualities, too. This track, an alternate version of a song included on Gabriel's Us, lacks the vocal addition of Sinead O'Connor and becomes a sparser, tenser song because of it — to me it sounds like bottoming out at the far point of a journey, then finding your way back up by making peace with the loneliness of arrival. Jane Siberry, "Sail Across the Water"
And then, finally, you arrive or break through or reach a destination whether it's the one you were after or not.